When I speak in pubic about autism, the question that continuously comes up, in many different phrases is “does my child with autism love me?” It’s a very difficult question for me to answer, because it saddens to me to think that parents feel unloved by their autistic children. It saddens me more to think that a child must continuously prove their love to a parent through socially acceptable gestures, and that those gestures are confined to the few our society defines. A hug, a kiss, a smile, a gentle touch, or the words “I love you,” and perhaps to a few, non-verbal hints given with looks or presence. Does love, or compassion, have to be delivered in a pre-defined box – I have a heart shaped box filled with candy, therefore I love you? If I think of you, is that not enough? What is enough? What happens when love is shown in such new and unexpected ways? Perhaps I am asking age old questions that persist even outside of the autism world. These may be questions no one knows the answers to as they struggle to exchange recognition. Yet, when put into the autism world, they are burdened with a new layer of strife between parent and child, adding the questions “Does my autistic child love me, or do others in my life just pretend to love me?” Nothing can rattle a cage more than uncertainty. I do not possess the wisdom to answer all these questions, but I can tell you a story. A story of a piece of me so close to my heart, that I have never spoken of it. Despite the intense vulnerability exposed by my revelation, I hope it gives all of you some solace and understanding. As a young child I was clingy with some, yet avoided contact with others. Contact from others was welcome on some days, and forbidden on different days. As I got older, this attitude seemed to become more complicated, and I grew distant from those I had allowed contact with me in my past. I understood hugging for comfort, but not for social expression, like when people hug to say hello or thank you. I wanted to connect, but only on my terms. I needed to understand why I was being touched and hold a reciprocal feeling. As I grew older, I realized others wanted hugs too, but I couldn’t for the life of me read when. One afternoon, while sitting with a friend who was recanting pain he was feeling with someone at school, I began to feel a vibration inside me. I recognized he was in pain and needed comfort, but as his need grew, so did that vibration inside me. By the time he was nearly to tears, I could no longer move. No matter how much my understanding of his needs became clear, the vibration inside me would not let me comfort him with contact. To this day, I do not think I have ever hugged him at a time of need. I just stand there like a tree. What was worse is my words get all jumbled up. I struggle to find comfort words, so I spit out “I’m sorry” and then immediately go to work trying to dish out advice that could make his pain go away. So why can I give words of advice and not words of comfort? Easy, words of advice come from my highly accessible logical process, while emotional words come from my nearly inaccessible emotional process. As time went on, and my friends had more problems they needed to unload, I became filled with these intense vibrations. The vibrations even obstructed my own feelings to the point I had no idea what to do. I would get sick to my stomach, giving me sensations much like ulcers. No matter what I tried to do for my friends, I only dished out the advice. Granted, the advice worked for most of them and they returned to get the advice, but it came at a price. I became the friend they vented to but rarely the friend they invited to partake in activities that involved emotional exchanges – happy or sad. 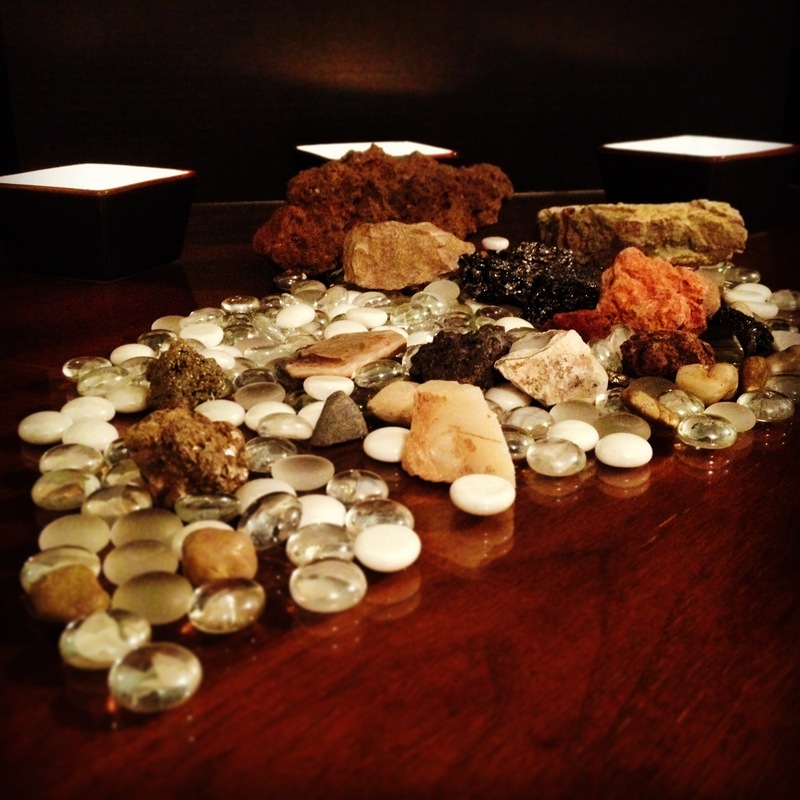 Frustrated and wanting to show my emotion on the outside, I turned to my rock collection. Yes, I said rock collection. In the movie With Honors (a 1990’s movie with Joe Pesci and Brendan Fraser that I love), the character Simon Wilder collects stones as memories. When he wanted to revisit the memory, he rubbed the stone to take himself back. I was fascinated by this idea. I pulled out my rock collection, and mentally labeled each one of them as a friend I was worried about. When I was overwhelmed with this worry, I would pull out the stones and look at them, rub them, or hold them. As my friends increased, and the number of their woes, I assigned little stones to the big people stones, and ended up with stone families. My love for my friends and family didn’t come out the way people are accustomed to physically expressing their compassion, but I still cared. Through my stones, I touched them with my thoughts, and cradled them in my hands. For me, compassion is such a heavy emotion to bear, that I cannot move when directly facing it. It was the stones that allowed me to be more for my friends, even if they never saw it. I didn’t need credit, nor did I need my compassion witnessed by the recipient for approval. I just needed a place to put it. The picture above is of all my stones, hidden among the decor in my house. As people pass out of my life, by death or just simply because life takes them another way, my worry subsides and they are transferred from the stone to my memory. Their stone is passed on to another that enters my life. In the special cases where the parting of a friend or family member leaves a hole inside me, I take their rock to a place I want to leave them, and I part with it forever. Maybe stones are not hugs, or kisses, or facial expressions of sympathy, but they are symbols of my compassion. Compassion that is deeply placed within me and far too delicate to expose. Perhaps your autistic child, or friend, or relative, cannot show you compassion in the way you wish. Though I ask you to believe me when I tell you that compassion is indeed there, waiting to be accepted no matter how it may be expressed.